This is not from the perspective of population and geographical area, but from its economic status, cultural influence, political importance and etc. Since the Qin Dynasty (221 BC - 207 BC), Guangzhou has been the political, economic, cultural, military and educational center of southern China. After more than 2,000 years of changes, Guangzhou has developed into a multi-functional mega-city, and it is also an important coastal port city and a famous tourist city in south China. 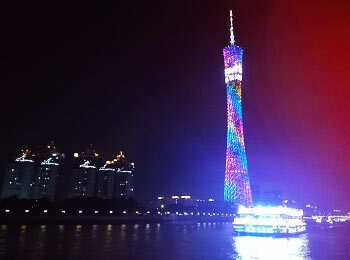 From the view of comprehensive strength, Guangzhou ranks third in China, after Beijing and Shanghai only. As one of the first ports for export and import trade in China, Guangzhou’s strong commercial influence on the country is embodied by the rapid development of its manufacturing industry. As a pioneer of reform and opening up, Guangzhou has been known throughout the country for its vigorous free trade and has always been China's most market-oriented first-tier city with the lowest cost of doing business. To date, almost sixty percent of the world’s top 500 companies have invested in Guangzhou, and some 120 have set up their headquarters or regional headquarters in there. Guangzhou hosts China Import and Export Fair (Canton Fair) twice each year. As the most important center of international trade in South China, this city has hosted the Canton Fair twice a year since 1957. Generally speaking, the two sessions are respectively from Apr. 15 to May. 05 and Oct. 15 to Nov.4. Detailed exhibitions include electronics & household electrical appliances, building materials & hardware, machinery equipments, food & drink, household items, fabrics and home textiles. Guangzhou houses many historic relics. Thanks to its long history of Guangzhou dating back to the Qin Dynasty, Guangzhou boasts plenty of well-preserved historic relics, like the Museum of the Western Han Dynasty Mausoleum of the Nanyue King, Guangxiao Temple, Ancestral Temple of the Chen Family, Huaisheng Mosque, The Five Goat Stone Statue in Yuexiu Park and Temple of the Six Banyan Trees. Guangzhou is a paradise for shoppers. The city has a massive number of malls and retail stores. Grand shopping malls such as the Tee Mall Plaza, the China Plaza plus the trade fairs in the Guangzhou International Building provide easy access to top-notch products from all over the world. Visitors can also enjoy shopping on the Shangxiajiu Pedestrian Street and Beijing Road. Apart from that mentioned above, Guangzhou wholesale markets play a core role in stimulating the city’s economy, such as Baima Clothes Wholesale Market and Shahe Clothes Wholesale Market. Each year, many foreign merchants and businessmen head to Guangzhou in search of products. Bargain is common in Guangzhou. It would be a unique experience to bargain when shopping in the city. As the wholesale markets thrive there, consumers always be sure of a sizeable discount if they buy the products in a large quantity. Try to bargain and negotiate with the seller, and you will get a suitable price for your selected goods in wholesale markets. Certainly, bargaining is not available in grand shopping malls. Guangzhou has more restaurants and teahouses than any other city in China. Cantonese cuisine (Yuecai), one of the eight famous cuisines of China, is redolent with color, fragrance, taste and presentation. Yuecai is an absolute "must do" when dining there. Try the famous Cantonese pastries well known for their wide range of varieties, delicate flavors and different hues. Morning tea is a traditional custom for local people, especially old people. Kung fu tea and tasty dim sum is the perfect match for morning tea. Should you wish to try dim sum, shrimp dumplings and steamed shaomai should not be missed. During the Zhou Dynasty (1045 B.C. – 256 B.C.) the Cantonese people suffered from famine for many years. Legend has it that one day five immortals riding five goats with rice ears each of a different color descended from heaven and blessed the area with favorable weather that produced rich harvests. Thus, this city is also known as the “Five-Goat City (Wuyangcheng)” and the “City of Spike (Suicheng)”. To express their gratitude to the celestial beings, the locals erected the Five Immortals Temple. Guangzhou is located in the subtropical coastal area, and has a maritime subtropical monsoon climate. The average annual temperature is around 20℃ (68℉) with plentiful rain, creating a perfect ecological environment for trees and flowers to grow. The city is covered with evergreen trees and flourishing flowers all year round. Since it is a core transport hub for export, a vast variety of flowers have also been introduced from overseas countries, like jasmine, henna and frangipani. During the Chinese New Year, the grand themed flower markets are always held in some of the city parks. The Maritime Silk Road is an important trade route between ancient China and Southeast Asia and the Indian Ocean regions. Guangzhou was selected as one of the beginning points thanks to the location close to South China Sea. During the Tang Dynasty (618-907), it was once called Guangzhou Maritime Road in Foreign Countries, ranking the longest ocean trade route in the world at the time. Starting from Guangzhou, the Maritime Silk Road, traveled through the Indian Ocean into the Red Sea, finally reaching East Africa and Europe, passing by over 100 countries and regions. I have a layover in Guangzhou Airport for about 12 hours. What places can I see in that short amount of time and what is the best place close to the airport to eat authentic dum sum? According to your layover time, you have enough time to tour around downtown area and taste local authentic dum sum. Shangxia Jiu Lu Pedestrian Street and Haizhu Plaza are nice choices. Hope helpful! You need to take subway line 2 to DG Railway station and then take a bullet train to Shenzhen Railway station. The train takes about 50 minutes. After that, go east for 5 minutes to Luohu Port and through it to HK. Then, take the HK subway to HKIA. To MILE: From Shenzhen train station to Lohou port do we need to ride a taxi then connect to a train to the HKIA? Or is that just walking distance? It’s a walking distance, less than 1km. Ni hao from Belgium. I'm planning on a trip to Canton next june. I would like to experience a true taste of China in the heart of old GZ. In which borough or district would you recommend me to stay? Go to Huangshan / Cultural Park or Shamian Island to feel the old life of the city. What places in Guangzhou that is near the airport? Can we visit within 6 hours including travel time from and going back to the airport? Yes, you can pay a visit to Yuexiu Park. You need to take metro line 3 and transfer to line 2 at Jiahewanggang, and then get off at Yuexiu Park, which takes about 40 minutes and CNY7.